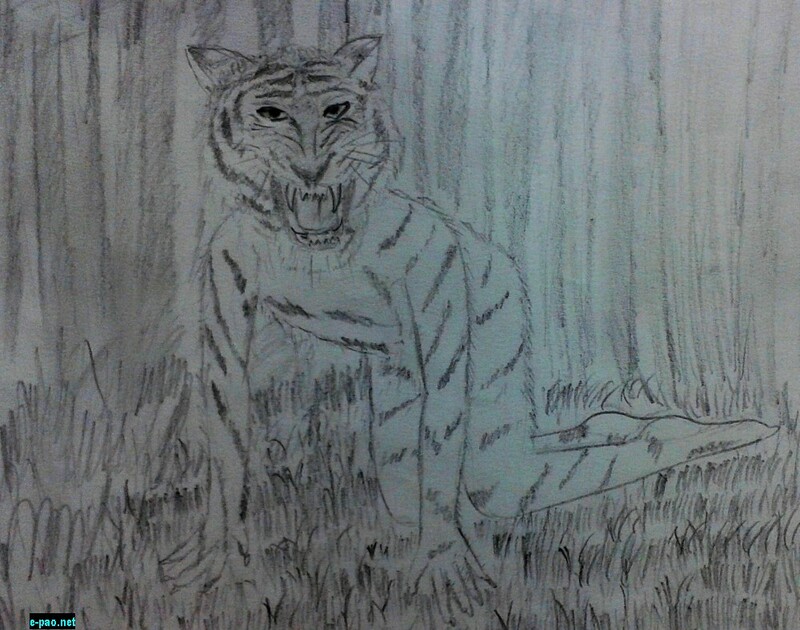 Once upon a time, in a village, there lived a man called Keibu Keioiba who was human in daytime and during night he would turn into a tiger. He was all alone. There was nobody to cook food for him or wash his clothes. Every night he turns into a tiger and wander around for food. One night, while he was out hunting for food he came across an old lady's house. He woke up the old lady. When the old lady came out to see who was there knocking at her door she was shocked to see Keibu Keioiba. With frightening voice, the old lady said, "I am old. My skin is wrinkled. I won't be tasty. In my neighbor, towards the northern side, there is a lone house. There is a young lady called Thabaton, the only daughter among seven brothers. She is really pretty. You should eat her. She is very soft; must be very tasty. Her seven brothers are not home. They went for business." Keibu Keioiba became restless to see the girl. The old lady further said the trick to open the door of Thabaton's house, "My dear sister, Thabaton, your seven brothers have come. Open the door." As instructed by the old lady, Keibu Keioiba came to Thabaton's house. He knocked at the door and said, ""My dear sister, Thabaton, your seven brothers have come. Open the door." Thabaton said, "The voice doesn't sound like my seven brothers. No, I won't open the door." Disappointedly Keibu Keioiba came back to the old lady's house and said, "As I cannot eat Thabaton, I have to eat you." Since the old lady doesn't want to die, she said, "I'll make her open. Come with me." Both of them came to Thabaton's place. The old lady stood in front of the door and said, "Dear sister of seven brothers, your seven brothers who had gone for business to earn living have come back. Open the door." Thabaton thought it was her seven brother's voice and opened the door. When she came out she met Keibu Keioba who was standing in front of the door. Meanwhile the old lady managed to escape from there. Keibu Keioba forcefully took Thabaton with him. The seven brothers who had gone on a business purpose returned home. When they saw the door was opened, they were taken aback. When they entered the house Thabaton was missing. They asked the old lady from their neighbor. She told them that their sister was taken by Keibu Keioiba. The seven brothers, holding knives on their hands, set out to search for their sister. How hard they tried they couldn't trace their sister. On the other side, Keibu Keioiba didn't eat Thabaton. He kept Thabaton as his wife in a hut inside a jungle. Keibu Keioiba would bring edibles from the jungle and Thabaton would cook food for them. Thabaton's brothers kept on searching for their sister across many jungles and dense forests. And one day, they saw Thabaton, living in a hut. When they came closer to the hut they saw a man and a woman along with a kid. The woman was none other than Thabaton. The brothers signaled Thabaton that they had come to rescue her. The following day, Thabaton met her brothers and cried along with them. They planned to quickly run away from that place. When Keibu Keioiba returned, Thabaton was holding an Utong (wooden pipe) which has holes on both the sides and said to Keibu Keioiba that, "Husband, there is no water to cook food. So fetch some water from the stream through this Utong." Keibu Keioiba came to fetch water with the Utong which has holes upside down. When keibu Keioiba went to fetch water, the seven brothers who had been hiding in a bush came out. They burnt the house of Keibu keioiba and killed his baby. They quickly ran away with their sister, Thabaton. On the other side, Keibu Keioiba couldn't fetch the water with the Utong; repeatedly he was fetching water and leaked afterwards. A crow was observing Keibu Keioiba's movement from a tree. The crow wanted to teach Keibu Keioiba about his foolish behavior. So the crow crowed, "Keibu Keioiba Naning Namang Hotrong Ho, Natu Leima Kangkok (Indicating foolish nature of Keibu Keioiba and also informing that he lost his wife)." The crow crowed it several times and Keibu Keioiba thought it was strange. Leaving the Utong, Keibu Keioiba quickly ran to his house. When he reached at his place, his wife, Thabaton was missing. He saw his house was burnt and the dead body of his son was lying on the ground. Keibu Keioiba became furious. Keibu Keioiba, fumed with anger came towards the house of Thabaton to get her back. The seven brothers knew Keibu Keioiba would surely come to look for Thabaton. Hence they were all prepared with their weapons and waited for Keibu Keioiba. As soon as Keibu Keioiba reached the gate, the seven brothers who had been waiting for Keibu Keioiba suddenly came out. The brothers slashed Keibu Keioiba with their knives and Keibu Keioiba died after being pounded with hammer by the seven brothers. After the death of Keibu Keioiba, Thabaton lived happily with her seven brothers.